Armies march, bullets fly, monks pray and fight, evil lords say evil things while Jackie Chan provides comic relief – all orchestrated by Benny KILLER CLOWNS FROM OUTER SPACE Chan. 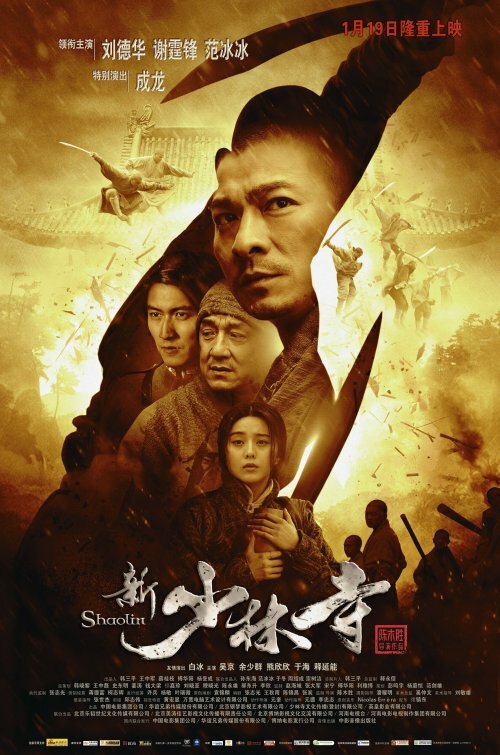 SHAOLIN or THE NEW SHAOLIN TEMPLE is an update of Jet Li’s debut from 1982, but is mostly related by name and concept, not so much through storyline or characters. 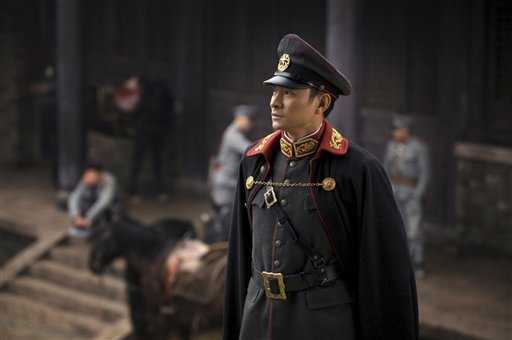 Released closely to Chinese New Year 2011 it is one of the less commercial almost-CNY-films, however tries to draw in the crowds with household names (Andy Lau, Jackie Chan et.al.) and big PR (concentrating on budgets, locations, stars etc.). So how did it turn out? Let me answer this question by going into a few details. 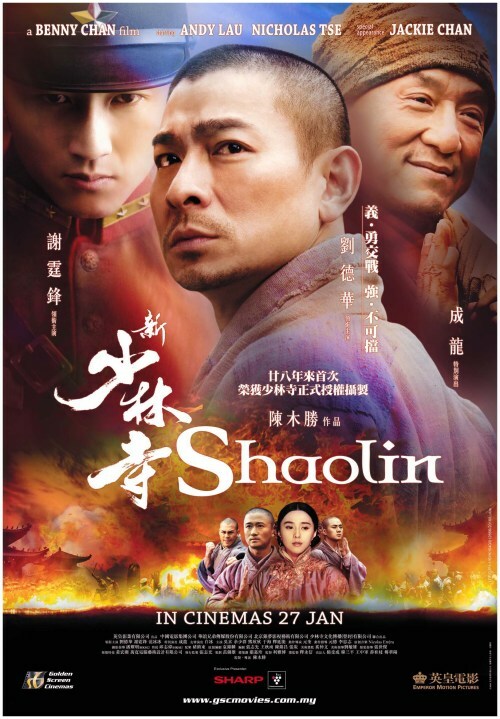 SHAOLIN is, in principle, supposed to be a martial arts movie, and I believe that is what most people who know the Jet Li film or any of the other Shaolin-themed flicks of the past decades expect. 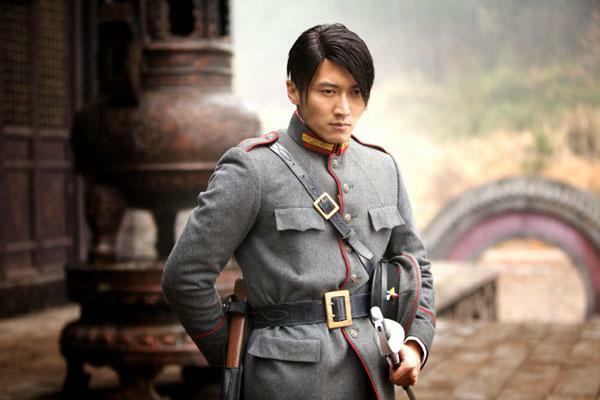 What sense does it make therefore to cast an ageing star and non-martial-artist (Lau) as the hero, an ageing martial arts star solely as comedian (Chan) and a few younger, more capable fighters as cannon fodder? None, right. Also, you wouldn’t expect SHAOLIN to be primarily an epic tale of rival warlords and the westernization of China, repeating pretty much what last year’s blockbusters have featured well enough. 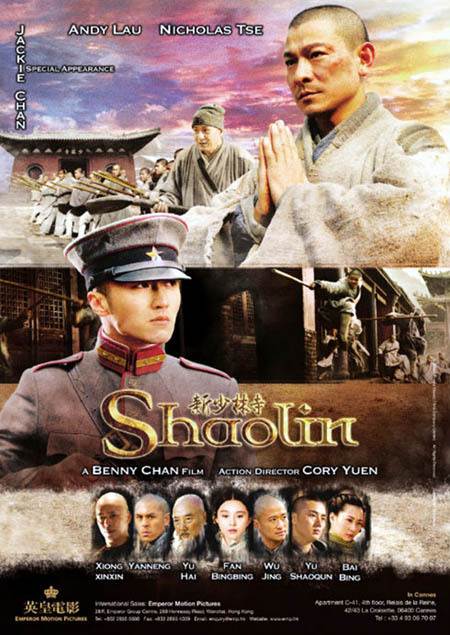 SHAOLIN pays relatively little attention to Shaolin, the monks and the martial arts heritage, instead loses itself in confusing plot threads, personal feuds and vaguely developed characters who mostly contribute nothing to the development of the story, which by the way would work quite as well without the Shaolin. 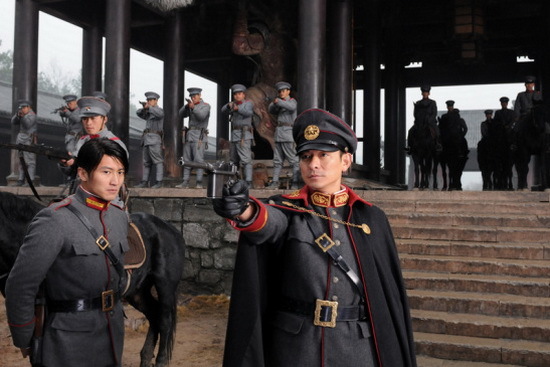 As expected, Benny Chan’s direction has no focus, resulting in a movie that seems randomly assembled, with various units filming all kinds of scenes and a failed attempt to patch things together. One again Mr. Chan proves to be a stranger to coherence as much as a stranger to the more traditional martial arts cinema, as well as having little eye for details. The extensive wirework feels outdated and repetitive, frankly speaking it’s unimpressive, the way the action scenes are captured lacks verve and inspiration, the extensive use of doubles is too obvious and many special effects seem out-of-place. What I found most lackluster is the fight choreography, as the film passes by without a single original idea to beef up the action. And the training sequences of the monks are a bit funny to watch, as their positions and movements never seem aligned correctly – the choreography of any Lady Gaga show is more precise than those training sequences. Thematically, SHAOLIN is by the book, featuring ideas like brotherhood, hierarchy, code of honor, love, trust and betrayal in A-Z order, ticking off one by one from the must-have-ingredients list. The most remarkable message of the film, especially bearing in mind that Chinese New Year was around the corner, is that materialism and pursuit of money shouldn’t be our main goals in life (SHAOLIN doesn’t really answer the question what should be instead, though). So in light of the ever money-centered CNY SHAOLIN tries to make a point, but I am not sure if the audience will really get it or mostly miss the one or two respective lines of dialogue by Andy Lau’s character. 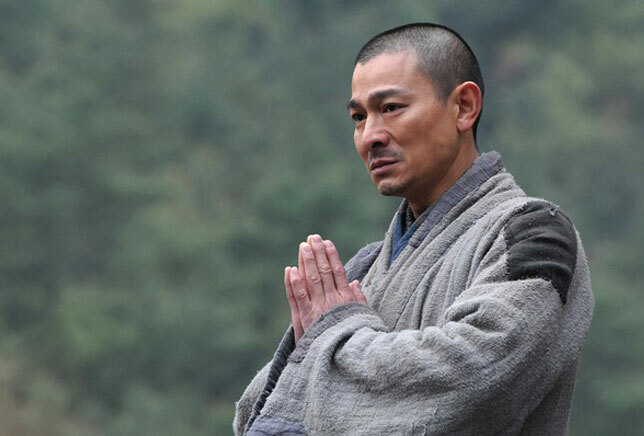 I don’t know what others have seen in SHAOLIN, but as far as I am concerned SHAOLIN is an exceptionally uninteresting film, a whopping two hours of boredom, a revue of incoherent scenes and plot threads leading nowhere, a mixed bag of whatever sprung the makers’ minds. What were they thinking? 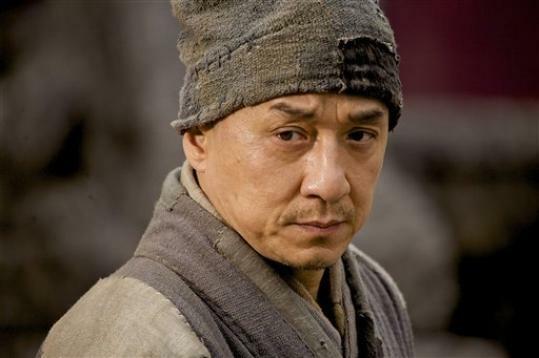 Armies march, bullets fly, monks pray and fight, evil lords say evil things while Jackie Chan provides comic relief. This entry was posted on 2011/02/13 at 22:10 and is filed under HK YEAR OF PRODUCTION 2011, TITLE N, TITLE S, TITLE T.	You can follow any responses to this entry through the RSS 2.0 feed. You can leave a response, or trackback from your own site.